The Waterberg Copper butterfly was originally discovered at Perdekop near Jan Trichardt’s Pass in the central Waterberg in 1982 by Dave & Esmé Edge (Edge 1982). It had not been seen for 21 years (last specimens collected in 1992) despite extensive searching by LepSoc members (Dobson & Garvie 2005). The butterfly had been initially misidentified as E. acraeina but it was formally recognised as a distinct and endemic South African species in 2010 (Gardiner & Terblanche 2010). LepSoc initiated the Custodians of Rare and Endangered Lepidoptera (COREL) programme during 2011 (Edge 2011). COREL was initiated to address the urgent conservation needs of 15 Critically Endangered (CE) taxa in South Africa. Jeremy Dobson, Chairperson of the Highveld Butterfly and Moth Club (HBMC), and Owen Garvie (also HBMC) were appointed as custodians of this butterfly. After a further lack of success to locate new localities in 2011/2012 (Edge 2014), Dobson produced a “wanted” poster and reward for anyone rediscovering the butterfly. The butterfly was then rediscovered on 2 March 2013 by Mark & Tildie Williams in the Bateleur Nature Reserve (BNR) north of Bela Bela, some 40 km from its type locality. This exciting find received wide publicity on the internet and in the media. In the recently published South African Butterfly Atlas, Erikssonia edgei was assessed under the IUCN criteria as Critically Endangered (Mecenero et al. 2013). The loss of E. edgei from its original locality in the mid 1990’s took place despite knowledge of its life history (Henning & Henning 1984) and a conservation effort by the authorities (de Wet 1995). It is therefore of the utmost importance that a scientifically researched and sustainable conservation plan is put in place as soon as possible so that we do not lose the species from the new locality. The owner of BNR, Wouter Schreuders, has pledged his support to these efforts and has agreed that the land will be managed in accordance with future research findings. Originally Red-Listed as VULNERABLE (Henning & Henning 1989). Was upgraded to CRITICALLY ENDANGERED in the latest revision of the Red List (Henning et al. 2009), and confirmed in the South African Butterfly Atlas (Mecenero et al. 2013). Perdekop, Tilodi Game Farm, near Jan Trichardt’s Pass, Limpopo Province. Coordinates 24° 27ʹ 33.0ʺ S; 27° 50ʹ 34.3ʺ E, altitude 1595m. The two known areas where the butterfly has been found are separated by 41 km. The vegetation type in which both localities are situated is quite widespread throughout the Waterberg Mountains, so the possibility exists that it could have a more extensive distribution. The type locality habitat is savanna, in vegetation type Waterberg Mountain Bushveld (SVcb17 – Mucina & Rutherford, 2006), and is situated near the base of the west flank of the Perdekop hill. The substrate is deep reddish sand, with a slope of 3 degrees (De Wet 1995). The tree component of the vegetation consists of Ochna pulchra Hook. f. (Ochnaceae), Burkea africana Hook. (Fabaceae) and Protea caffra Meisn. (Proteaceae) (De Wet 1995). The BNR localities are also in the savanna vegetation type SVcb17, and are mainly grassland with sparser trees than at the type locality. The first locality liesin the middle of a wide open amphitheater surrounded by low hills, with a green vlei area in the centre of the amphitheater. This locality (coordinates 240 40ʹ 50 ʺS; 280 10ʹ 58ʺ E, altitude 1550 m) is close to a red sandstone/quartzite outcrop of small boulders and rocks, some of which display yellow and green-coloured lichen. The second locality (coordinates 240 40ʹ 38ʺ S; 280 10ʹ 30ʺ E, altitude 1580 m) is beyond a game fence in a saddle area between two rocky hills forming the western perimeter of the amphitheater. This locality has a mixture of different grasses and although no solid sandstone outcrop is present, several lichen-covered boulders occur amongst the shallow stands of grass stems. The adults are now known to fly from November to April. They fly slowly and weakly in open grassy areas with sandy soil, and do not range far from their host plants. The males usually stake out small territories amongst the host plants where they can be found most of the day. The females fly at random across the area and are less common than the males. Both sexes sometimes bask in the sun, lying on their side to get maximum heat uptake, and they often feed on flowers. The bright colouration may act as a deterrent to predators, and the adults may in fact be toxic due to poisons sequestered (in the larval stage) from its poisonous host plant. Henning & Henning (1984) and Henning (1984) discovered and described the life history from observations at the type locality. 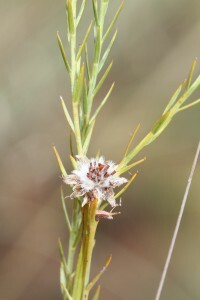 The larval host-plant was found to be Gnidia kraussiana Meisn. var. kraussiana (Thymelaceae), and the larvae were associated with a Lepisiota ant species. More recently, investigations at the BNR have revealed that E. edgei also oviposits on, and the larvae feed on Gnidia microcephala Meisn., as well as on G. kraussiana which also occurs at the BNR. 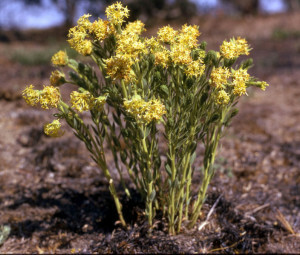 Both of these host plants contain poisons which the larvae are able to deal with and their bright colouration may also signal that they are poisonous to predators. Originally identified as Erikssonia acraeina Trimen, 1891. The Waterberg population was recognised as a separate species after a review of the entire genus conducted by Gardiner & Terblanche (2010). The investigation examined the type specimens of E. acraeina from southern Angola, and compared them with both the known Zambian populations and the Waterberg population. 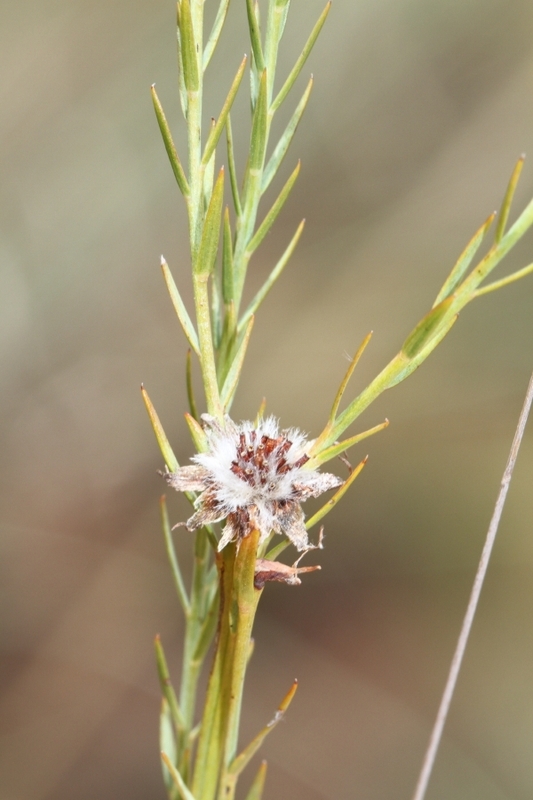 Significant morphological differences as well as host plant differences led to the conclusion that the isolated Waterberg population had evolved into a separate species. The main threats are perceived to be either over-grazing or under-grazing and an incorrect fire regime. The loss of the population at the type locality was probably as a result of not managing these factors correctly. It is likely that the two most important and inter-related management factors influencing the population are grazing intensity and fire. High grazing intensity leads to a decrease in fire intensity so even though the herbivores may not graze the Gnidia host plant it is their influence on the habitat which changes the conditions for Gnidia growth. It is therefore important to promote the conditions that lead to maximum growth of the host plant, and we should focus on practical aspects of land use management. A historical study of the land use practices is needed, since these past conditions were obviously suitable for the species. Experimentation with different levels of herbivory, possibly by establishing a fence around one of the localities, would enable it impacts to be gauged. Medium intensity herbivory was introduced to the area about two years ago. Soil type could also very well be important – most species of this genus are known to prefer sandy conditions – but E. edgei appears to be on more loamy sand than its congeners. Monitoring population size of Erikssonia edgei, the host ants and the host plants. De Wet, J.I. 1995. The management of the butterfly Erikssonia acraeina, Trimen, 1891 (Lepidoptera: Lycaenidae) in the Waterberg. Metamorphosis 6(3): 146–148. Dobson, J. & Garvie, O. 2005. A report by the Lepidopterists’ Society of Africa on the current status of the South African population of Erikssonia acraeina Trimen, 1891 (Lepidoptera: Lycaenidae). Metamorphosis 16(3): 67–71. Edge, D.A. 1982. Rediscovery of a rare butterfly. Rostrum, Newsletter of the Entomological society of Southern Africa 2: 2. Edge, D.A. 2011. Custodians of rare and endangered Lepidoptera (COREL).Metamorphosis 22(3): 81-96. Edge, D.A. 2014. 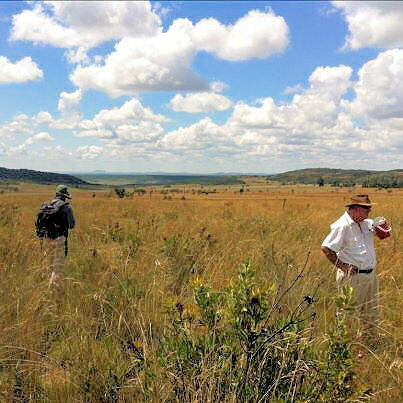 Searching in the Waterberg for Erikssonia edgei Gardiner & Terblanche, 2010 during December 2011 & January 2012. Metamorphosis 25: 77–81. Gardiner, A.J. & Terblanche, R.F. 2010. Taxonomy, biology, biogeography, evolution and conservation of the genus Erikssonia Trimen (Lepidoptera: Lycaenidae). African Entomology 18(1): 171–191. Henning G.A. & Henning S.F. 1995. Updating the status of South African Red Data butterfly species. Metamorphosis 6(2): 96–98. Henning, G.A. & Henning, S.F. 2001. Review of the genus Erikssonia Trimen (Lepidoptera: Lycaenidae: Theclinae) with a description of a new species. Metamorphosis 12(2): 69-78. Henning, G.A., Terblanche, R.F. & Ball, J.B. 2009. South African Red Data Book: butterflies. SANBI Biodiversity Series 13. South African National Biodiversity Institute, Pretoria. Henning S.F. 1984. Life history and behaviour of the rare myrmecophilous lycaenid Erikssonia acraeina Trimen (Lepidoptera: Lycaenidae). Journal of the Entomological Society of Southern Africa 47(2): 337-342. Henning S.F. & Henning G.A. 1984. Life history and behaviour of Erikssonia acraeina Trimen (Lepidoptera: Lycaenidae). Metamorphosis 1(5): 1-4. Henning S.F. & Henning G.A. 1989. South African Red Data Book – butterflies. Foundation for Research Development, South African National Scientific Programmes Report no. 158. Council for Scientific and Industrial Research, Pretoria. Henning S.F., Henning, G.A. & Samways, M.J. 1993. Erikssonia acraeina Trimen; subfamily Theclinae, tribe Aphnaeini. In T.R. New (ed.) Conservation biology of Lycaenidae (butterflies). Occasional paper of the IUCN Species Survival Commission no. 8: 156, 157. IUCN, Gland, Switzerland.